These beautiful micro-macrame earrings were hand knotted with a light green colored nylon cord. Three sizes of Czech glass seed beads to compliment the color scheme. These are surprisingly lightweight to wear and have nickel free gunmetal plated earring wires. 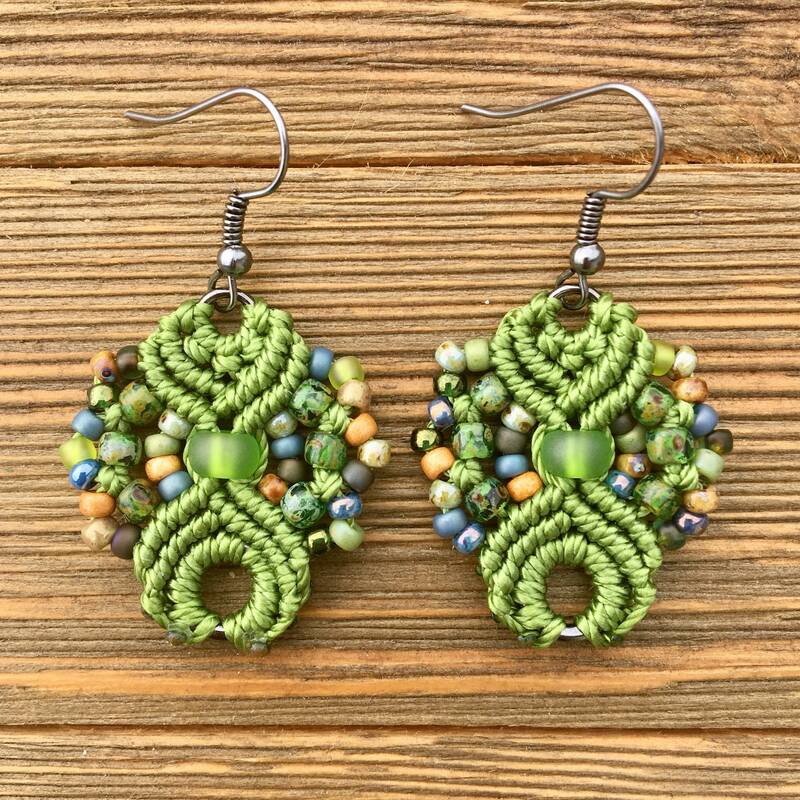 Micro-Macrame Earrings. Small Beaded Earrings. Macrame Earrings. Powder Blue Knotted Earrings. Boho Fashion. Statement Earrings. Micro-Macrame Earrings. Small Beaded Earrings. Macrame Earrings. Mahogany Knotted Earrings. Boho Fashion. Micro-Macrame Earrings. Small Beaded Earrings. Macrame Earrings. Pale Pink Knotted Earrings. Boho Fashion. Statement Earrings. Micro-Macrame Earrings. Small Beaded Earrings. Blue Macrame Earrings. Blue Knotted Earrings. Boho Fashion. Statement Earrings. Micro-Macrame Dangle Earrings. Small Beaded Macrame Earrings. Boutique Fashion. Knotted Beaded Earrings. Beaded Earrings. Copper Beaded Earrings. Macramé Beaded Earrings. Small Beaded Earrings. Statement Earrings. Micro-Macrame Earrings. Macrame Earrings. Chevron Earrings. Pink Earrings. Summer Fashion Jewelry. Knotted Earrings. Boutique Fashion. 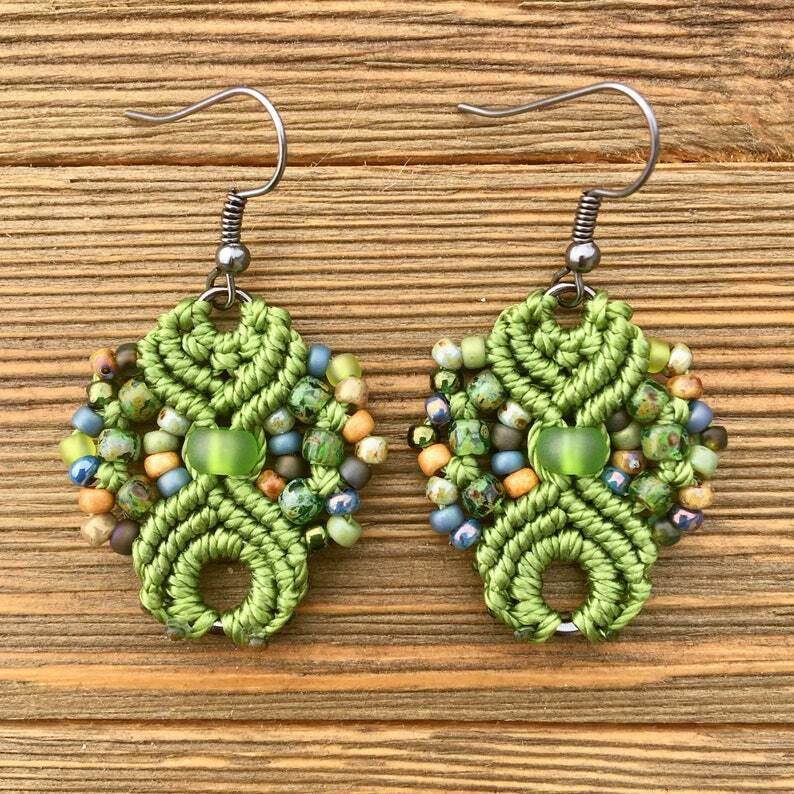 Micro-Macrame Earrings. Macrame Earrings. Chevron Earrings. Black Earrings. Summer Fashion Jewelry. Knotted Earrings. Boutique Fashion.